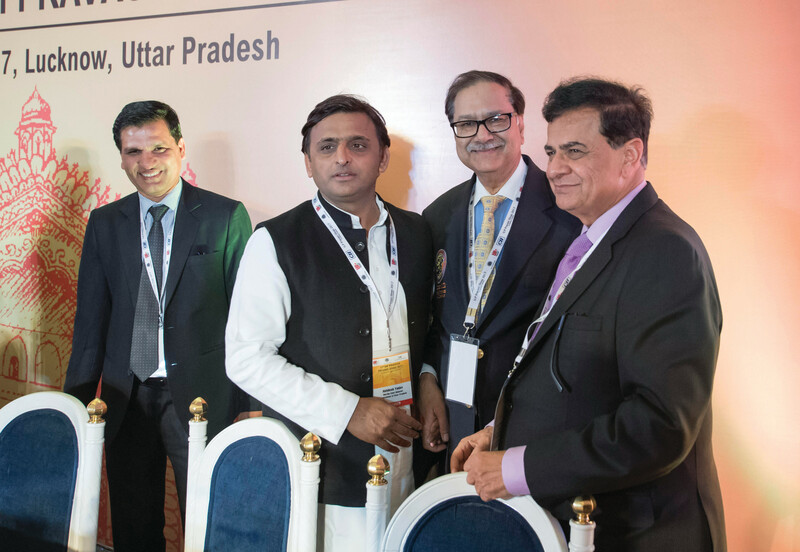 Dr. Sudhir Parikh, publisher of New India Times, and recipient of the Padma Shri award, right, with Dr. Kishan Kumar from New York, third from left, and Uttar Pradesh Chief Minister Akhilesh Yadav at the U.P. NRI Diwas in Lucknow. 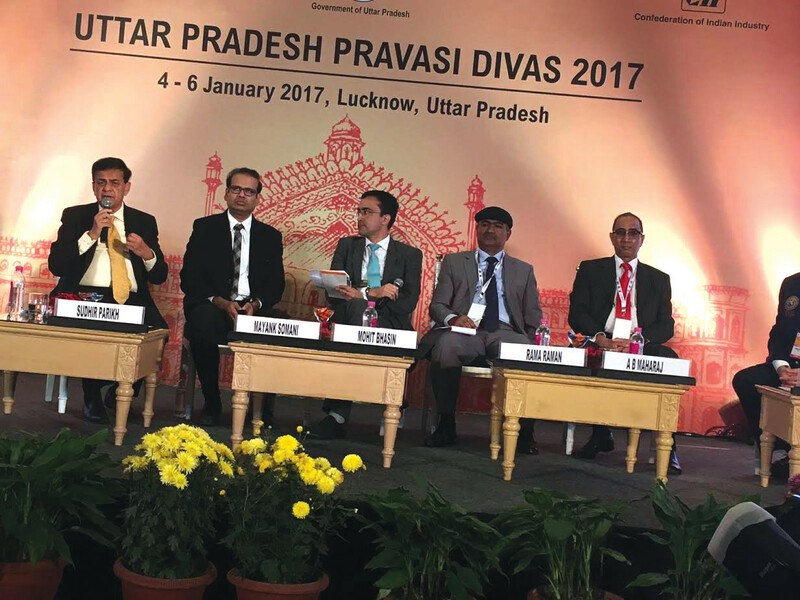 A year after the first such NRI Diwas in Agra, the Uttar Pradesh government last week organized the second edition of the conclave of expatriate Indians, this time in Lucknow, inaugurated by chief minister Akhilesh Yadav. The three-day event was attended non-resident Indians from all over the world, most of them from Uttar Pradesh, but also some who were not native to the state. Yadav gave away the Uttar Pradesh Pravasi Bhartiya Ratan Awards to 13 NRIs for excellence in different fields. Prominent among others who attended the Jan. 4-7 conclave was Prithvi Raj Singh Roopun, minister of social integration and economic empowerment as well as minister of Arts and Culture, Mauritius. “The aim of organizing the event was to highlight the work done by the state government in the fields of healthcare, investment, infrastructure, SME, skill development and education” an government official said. The NRI Diwas had various sessions based on the theme ‘Ummedon Ka Pradesh, Uttar Pradesh’ and other topics relevant to the state that showcased its “immense potential” of public-private partnerships as well. Touching upon these potentials, especially in health care where there is lots of scope for involvement of NRIs, Dr. Sudhir Parikh, publisher of New India Times, and Padma Shri award recipient, said India has great potential for enhancing its healthcare system, but current obstacles and challenges need to be addressed and overcome. Dr. Parikh addresses audience at the U.P. NRI Diwas. “All countries have access of care issues in healthcare, but India has one of the biggest disparities between its rural vs. urban populations. Generally there are better clinics, hospitals, and doctors, both public and private in urban settings in India. However, more than 70 percent of India’s population is in rural areas with limited access to care,” Parikh said. Government programs need to focus on preventative and primary care rather than just the high risk populations. Conditions such as cardiovascular health, diabetes, hypertension, asthma, allergy, HIV, and hyperlipidemia are on the rise in India and require preventative care and chronic care. “This is in the long run is better for the patient and will also save India’s health care system money by decreasing complications,” he said. “Even though we are miles away, we NRI physicians can do a lot more than we think even from afar. Physician outreach programs, similar to doctors without borders, can be established to send specialists and other physicians to India to work and help train doctors in new advances both in rural and urban settings,” Dr. Parikh said. “Community outreach programs can similarly fill the void of doctors in these rural settings as many physicians of Indian origin have a desire to go back and help out in that regard,” he added.